Sometimes, you just want a small batch of biscuits. You know, just enough to have a few but not a ton to freeze. Maybe there's only one or two of you at home, or your kids are tiny and won't eat them anyway. The cool breezes of fall have arrived and you are sipping hot soups, and all you want is a fluffy, tender bit of warm bread to go along with. This recipe is perfect that way. You can, if you want, make it with a food processor, but mine is old and about to die, so I barely use it. 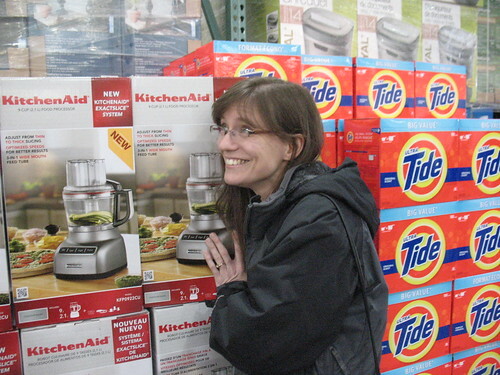 Instead I covet the Kitchen Aid 9 cup food processors at Costco. I love the idea of a small bowl for chopping just bits of things, and a bigger bowl for the rest. I've only ever had some tiny thing that I got for free through credit card points. They are hard to find the rest of the year, but every now and then I see them at Costco, all shiny and inviting. One day I'll have one, but it's not today. Today we go old school. Making this recipe by hand may make things a little slower, but I'm usually okay with that. The result is six wedge shaped biscuits, studded with bits of chives (which are entirely optional, by the way). We ate ours with maple baked beans and later some spiced lentil soup, but you can even split them open and stuff them with cold cuts and cheese, if you like. Either way, these are a beautiful way to use up bits of sour cream hanging out in the fridge. In a medium sized bowl, whisk together the sugar, flour, baking powder, and baking soda. Cut in the butter with a pastry cutter or two knives until the mixture looks like fine crumbs. You can also grate it on a box grater if you wish. Stir in the sour cream and onions. If it looks dry, you can add 1-2 Tbsp milk. Dump the mixture out onto the counter and bring it together with your hands, kneading it a few times until it comes together into a dough. At this point, I transferred the dough to a lightly floured cutting board and patted it into a 4 inch circle. Cut the circle into six wedges and place each onto a baking sheet. Bake the biscuits about 10 minutes, until they are puffed and browned. Remove them from the oven to a wire rack and try not to just begin stuffing them in your mouth. They are best eaten the same day, but if you have any left over just put them in a sealed baggie and they'll keep about a day. Do you enjoy biscuits? These bacon and cheddar ones are to die for!